Is this Traveller, but done in a 1e/2e D&D engine, or am I thinking of something else? Yep. That's basically it. It's a super smooth variant built on top of old D&D style mechanics, adding in backgrounds, skills, and acres of great support for "old-style play" (sandboxy, player driven, low prep). There's a great video review of SWN done by Questing Beast on YouTube that's worth watching. Highly, highly recommended. I own just about everything that Crawford has published -- his materials are not the most glamorously produced, but they are highly functional and useful. 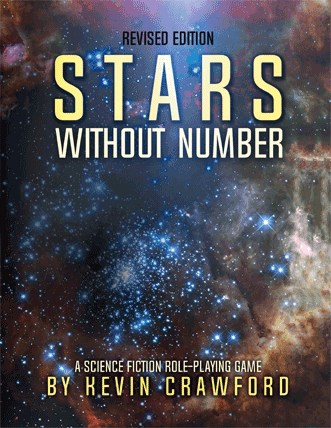 If I weren't playing Classic Traveller right now, I'd be playing Stars Without Number. Moldvay Basic D&D, but otherwise, yes, that’s it. Bundle One is a great starter, but it's really worth getting both. The "campaign style books" in the second bundle were produced for the first edition of SWN, but are easily usable with the revised edition and are a great addition to the palette.